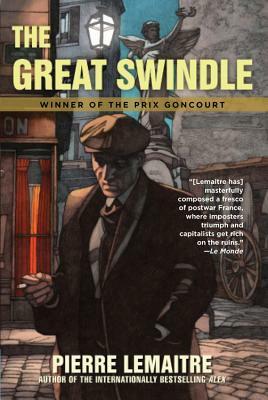 The Great Swindle by Pierre Lemaitre is not the sort of book that I associate with winning the Prix Goncourt, which is the most prestigious literary award in France. Although I’ve read hardly any of the winners, (only partly because not all of them are translated, a situation which seems to be improving), the impression that I have is that the winning books tend to be a bit demanding. One of the winners is Marcel Proust, in 1919, for Vol 2 of In Search of Lost Time: A l’ombre des jeunes filles en fleurs (In the Shadow of Young Girls in Bloom a.k.a. Within a Budding Grove). More recently I liked Marguerite Duras’s The Lover which won in 1984 but it’s written in an impressionistic style (see my review); OTOH I thought that The Patience Stone by Atiq Rahimi was an unconvincing attempt by a male author to represent oppressed Afghani women (see my terse review) and I suspect that the choice had more to do with politics than literature. But The Great Swindle is a page-turning novel of suspense and I am indebted to Stu from Winston’s Dad for his enticing review because despite its 459 pages I romped through it over two nights and was sorry to come to the end of it. We in Australia tend to sentimentalise the diggers of WW1, but Lemaitre has written a forceful story showing how three soldiers come back from the war corrupted by their experience, while at the same time exposing the shabby way veterans were treated by the French government and society. Albert and Édouard are traumatised by their war. In the very last days of the war, when both sides had ceased hostilities in anticipation of the armistice, their ambitious officer Lieutenant Pradelle was still intent on making a name for himself with a pointless assault on Hill 113. Albert was buried alive by the impact of a shell, and brought back to life only by the heroic efforts of Édouard who did further damage to his wounded leg in the process, and had half his face torn off by shrapnel as he dug frantically with his hands to get Albert out. It is a measure of how compelling the writing is that – although the blurb tells us that Albert survives the war – the sequence describing Albert’s entombment and rescue is heart-stopping. Lemaitre spares no details: it is grotesque and terrifying and a stunning feat of imagination. And it sets the tone for the rest of the book: we are on Albert’s side. He is an ordinary, unprepossessing bloke, and, as we are regularly reminded by his scornful mother, also none too bright – but the reader is desperate for him to find some measure of happiness. A happiness which the author seems determined to withhold! Édouard, the estranged son of a wealthy industrialist, enlisted in defiance of his father, to whom he is a grave disappointment. Édouard has a rare talent for drawing, and as a schoolboy he uses his art to draw outrageously provocative versions of great art works which depict the authority figures in his life fornicating. In addition to causing awkward situations at school that not even money could resolve, Édouard liked dressing up in his sister Madeleine’s clothes and makeup, and his louche mannerisms infuriated his father who basically disowned him. Édouard comes out of the war so grotesquely disfigured that he refuses to go back home and instead takes on a false identity, isolating himself in the shadows of Paris with the hapless Albert to care for him (and to find supplies of morphine for his addiction). Ah, but there is so much more to it than that! Édouard and Albert were witnesses to a war crime committed by Pradelle and he is not about to let these two interfere with his ambitious plans to profit from the war. Using connections forged by a prudent marriage to a woman with a fortune (I am being evasive to avoid spoilers), he sets up in the business of supplying coffins for the new centralised war cemeteries being established by the French government to reduce the cost of repatriating remains to the bereaved all over the country. Pending the payment of war reparations by Germany, the government is broke and the economy is in ruins. They save money with miserly pensions for veterans and by dismissing the concerns of the bereaved with unctuous claptrap about the heroic dead forming a brotherhood in their common burial grounds. If Pradelle could secure a small part of this business, for a few centimes apiece his Chinamen would dig up thousands of bodies, his trucks would ferry the thousands of rotting corpses, his Senegalese workers would rebury them in rows of neat new graves each with a pretty cross at a premium price – in less than three years there would be enough money to renovate the family home at la Sallevière, which at present was a crumbling ruin. At eighty francs per corpse, and assuming an actual cost of about twenty-five, Pradelle expected to make a net profit of two and a half million. And if, besides, the minister should approve various mutually agreed orders, even allowing for the necessary bribes, it could come to five million. Extravagant sample coffins to secure the contracts are soon replaced by cheap wooden ones that fall apart when transported, and more profit can be generated by making them all too short for the average Frenchman. But that’s not the worst of it, as the reader will eventually see. He saw pretty young girls here and there, in the shops, on the omnibus, many of them with no beau since so many men had been killed, girls who were waiting, watching, hoping, but Albert was no conquering hero, always glancing about him, skittish as a cat, with his battered shoes and a greatcoat that dribbled dye, he was not what anyone would call a catch. Édouard, who had never had to think about money, eventually realises that something must be done, and he cooks up a an audacious scheme for making a vast amount of money. It relies on the cooperation of a none-too-keen Albert who, caught in a trap not entirely of his own making, is terrified of Pradelle finding them and just wants to lie low in his hopeless existence. But things get more and more complicated (though not hard to follow because the book is so expertly constructed) and as Pradelle picks up the trail the suspense becomes almost unbearable because the reader has become so invested in Albert’s fate. Is The Great Swindle great literature, worthy of the Prix Goncourt? In some ways it reads like a 19th century novel: it has an irredeemably evil villain in the form of Pradelle; the author himself tells us that he is reminiscent of the vile Inspector Javert in Les Misérables. Like the fiction of Balzac and Zola, the story exposes corruption, bureaucracy and the squalor of the urban poor. Characters are boldly unforgettable; settings are generous with vivid detail. But no 19th century author could have imagined the horrors of the Great War, and the detached cynicism of the narrator could not have been created while the veterans still lived, even though this story pays homage to their courage. I can’t comment on the quality of the prose. All I can say is that it is ably translated and a pleasure to read. Here’s a review of the French edition, from Words and Peace. (The review is in English). Really? Oh, you are going to have a wonderful time, I am sure of it. I read the original in French and loved it. Great humor in it. Oh, that would be wonderful. My French is not good enough to catch jokes yet, but one day maybe! Love the sound of this one AND my library has a copy. Wish I could ‘romp’ through 459 pages! It’s retirement, m’dear, and a healthy disdain for housework!